I can be a bit picky, especially when it comes to my munchkin, so finding things like shoes can be a bit of a challenge. For myself, I'm a big proponent of minimal shoes. I would much rather go barefoot as much as possible. I mostly wear my vibram five-fingers for running and working out, my toms for casual wear, and a simple pair of black ballet flats from Land's End for work. I have fun boots and heels and stuff but they are only really for special occasions. When he started cruising the furniture I started looking for other shoe options, and wasn't too impressed with most of what we saw in the stores. Why on earth would I want to strap a heavy plank of rubber to my baby's developing foot? 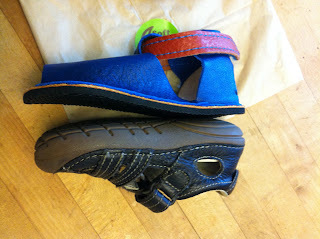 For summer I settled on a pair of Stride Rite SRT Soft Motion Sandals They worked out pretty well. They have a fairly soft and flexible sole, grippy enough to play on most surfaces, and they look cute. 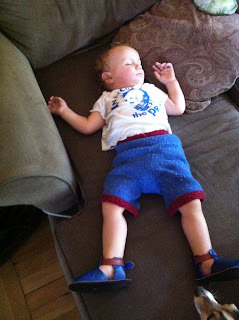 While camping this weekend I noticed the munchkin seemed a little uncomfortable on his feet and sure enough his sandals were getting a little snug. 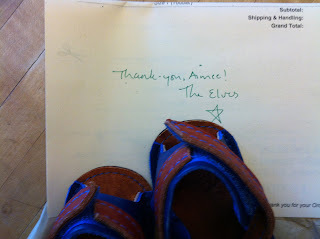 So after a little google-ing I came across Soft Star Shoes. 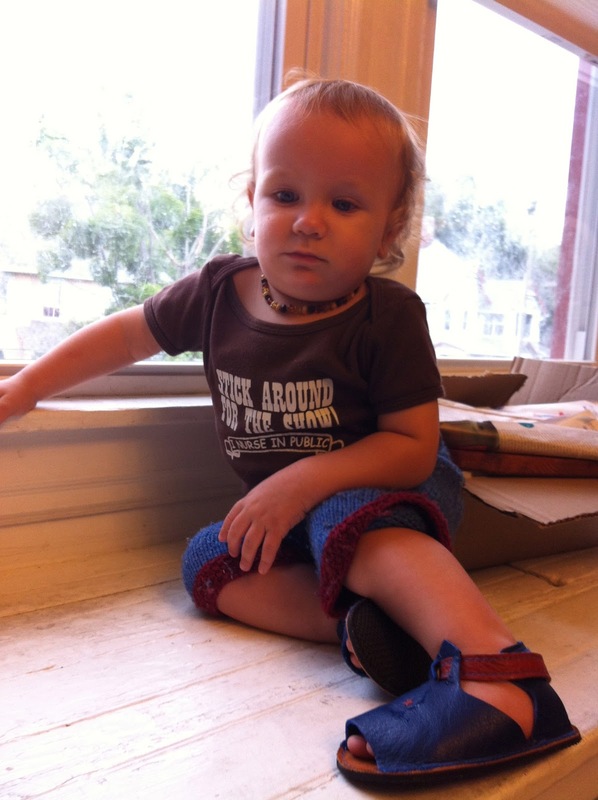 Soft Star Shoes is a small company based in Corvallis, OR that focuses on eco-friendly minimalist footwear for adults, kids, and babies. 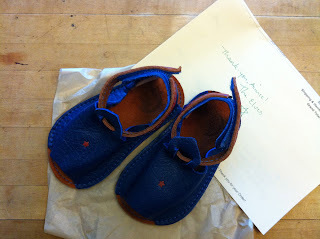 These looked perfect for my munchkin! I ordered him the Laguna Sandal Nova- Ocean. They have a great printable sizing guide for kids. Just print out the size you think you need and have your kiddo step on the paper and you can see if it will fit. I can't believe my baby is in a Toddler Size 7! 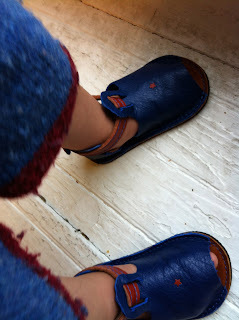 Since everything is handmade in their shop, they also also have Design Your Own options for practically all their shoes. I opted to buy something in stock though since I wanted them asap. I think next time around I might do the design your own option. I had a message later that evening that they had shipped. Excellent! I ordered them Monday and they arrived on my doorstep on Wednesday. Hooray. Nice and Flexible! Exactly what I was looking for. These felt incredibly well made. 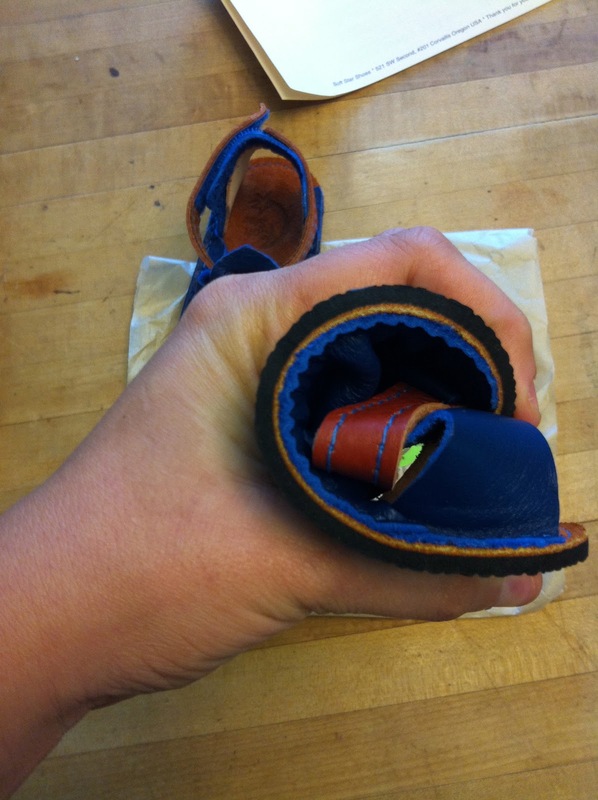 The stitching was perfect- no blemishes or loose threads, the materials were very high quality- the leather was soft and pliable, and the thin rubber sole appeared soft but sturdy. I couldn't wait to get them on the munchkin. Good fit. A little room to grow but not so much that he is sliding around or that it affects his walk. Pretty cute... and they match his blue and maroon woolies perfectly. We took them for a little test run and took the dog out for a walk. The munchkin happily ran up and down the sidewalk without really noticing his shoes... so I'll call that success! Today we went for a longer walk and played at the playground across the street. He was able to climb, run, and crawl with ease. 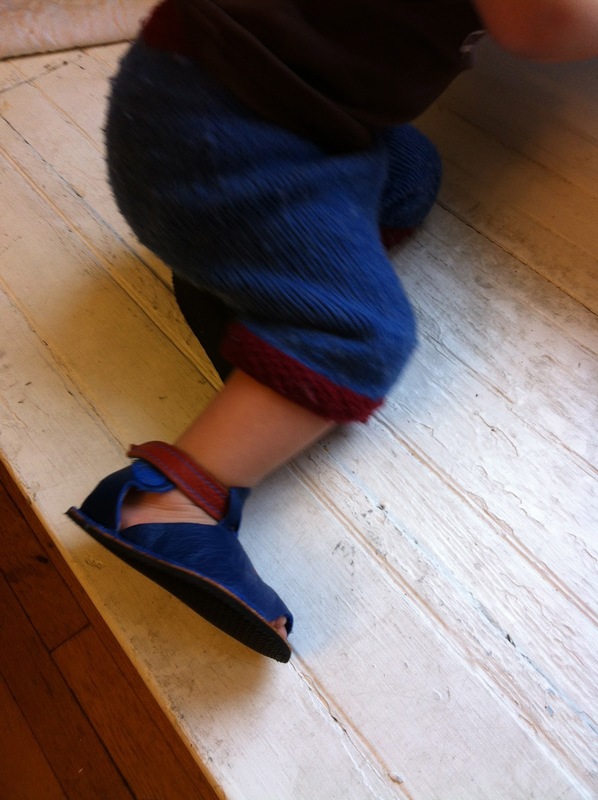 It was a woodchip playground, and even with the open-toe he didn't seem to get anything trapped in the shoes. Another success. They specifically make the toe opening a little smaller than most sandals so that kids toes don't slip through. Very Smart. I am extremely happy with these shoes. They were exactly what I was looking for. A little more expensive than what I've bought at stride rite (but only just barely)- but the materials and craftsmanship are superb- so totally worth the added expense. I will definitely be buying more shoes from them in the future. I am totally eying the RunAmocs for myself... and maybe these adorable MaryJanes!